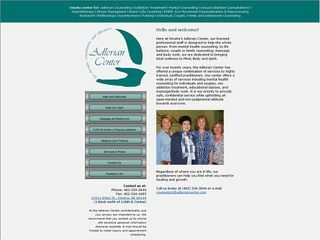 Description: Adlerian Center-Therapy Conslt is a business categorized under psychotherapists, which is part of the larger category offices of health practitioners nec. Adlerian Center-Therapy Conslt is located at the address 11911 Arbor Street in Omaha, Nebraska 68144-2970. The Owner is Georgia Bichekas who can be contacted at (402)334-3044. Location & access map for "Adlerian Center-Therapy Conslt"